Similar to “being dunked on”, it’s a phrase that’s been over applied. A player slipping on a wet floor, is tripped, or clipped by another player. Still these plays are miscategorized as a player having their “ankles broken”. An NBA player getting shook so badly that he falls down doesn’t actually doesn’t happen very often, but when it does, it reinforces what a true “broken ankle” looks like. 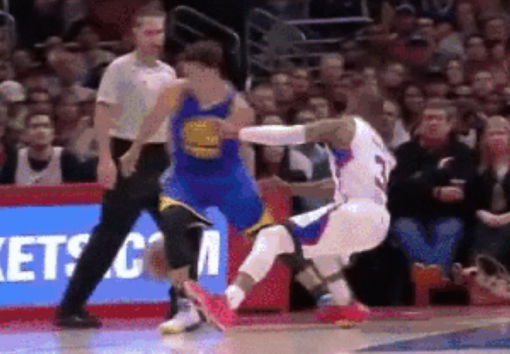 And when Steph Curry pulled out a double behind-the-back crossover that made Chris Paul lose his balance, that was the quintessential ankle breaking. Chris Paul is a intense, intelligent competitor and a really good defender. On top of that, Paul is player that has incredible balance and athleticism which only serves to underscore how dangerous Steph Curry’s handles in this situation. The ability to outthink his opponent usually serves Paul well in 95% of situations, but when defending Curry, it betrayed him. As a smart defender, Paul is often calculating his opponents next move to stay one move ahead. So when Curry drove the baseline with Paul following, Curry turned and went behind his back from right hand to his left hand. Paul assumed that Curry would try to turn and head back toward the basket so Paul stopped his momentum to defend. This is when Curry switched it up; dribbling the ball back to his right hand; essentially a double behind-the-back crossover that put the ball back into his strong hand and sent Chris Paul to the floor as his legs unsuccessfully tried to catch up. On one hand I hate to make fun of players that take defense as seriously as Paul does, after all Paul was giving all out effort to defend Curry, but sometimes…. damn, that’s a good move.